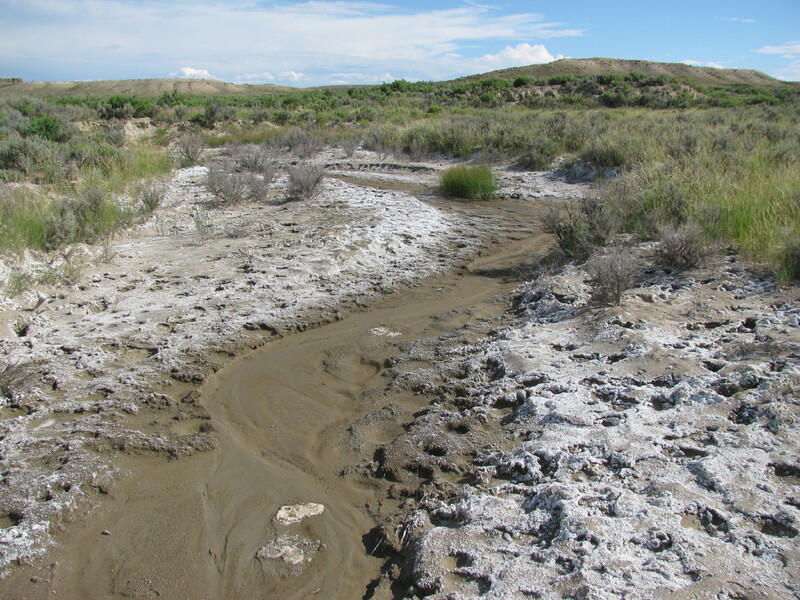 White crusts of natural salts along a tributary to Muddy Creek, Wyoming. Natural salts are present in soils from drier climates, and rain and snowmelt can percolate into the soil and carry the salts to streams. Photo Credit: Carleton Bern, USGS. Soil disturbance from construction of roads, pipelines, and well pads on naturally salt-rich soils was determined to be a potential factor resulting in increased salinity in a southern Wyoming stream. Construction can expose salt-rich soils in the subsurface to increased contact with rain and snow, thus mobilizing salts through runoff or water percolating into soils. In 2005, the U.S. Geological Survey (USGS) began a study to understand the factors that influence salinity in Muddy Creek, south central Wyoming. Scientists used a tiered approach to understand the primary factors influencing salinity concentrations in Muddy Creek. Scientists measured streamflow, specific conductance (a surrogate for salinity), and major ions from Muddy Creek above its confluence with the Little Snake River. Samples were collected before and after an increase in natural gas development (increase in roads, pipelines, well pads, and well installations). The scientists first identified all processes within the watershed with the potential to increase stream salinity and then determined which processes best described the salinity patterns in Muddy Creek. Stream salinity in semiarid climates generally goes down with increased streamflow and up with decreased streamflow. This type of predictable relation was determined for Muddy Creek during 2005–8. In 2009–12, the broad relation remained, but salinity increased 33 percent during the high flows of spring runoff and increased 53 to 71 percent during late summer, low flows. The additional salinity had a chemical profile dominated by calcium, magnesium, and sulfate, similar to natural salts present in soils that form on top of marine shales within the watershed. 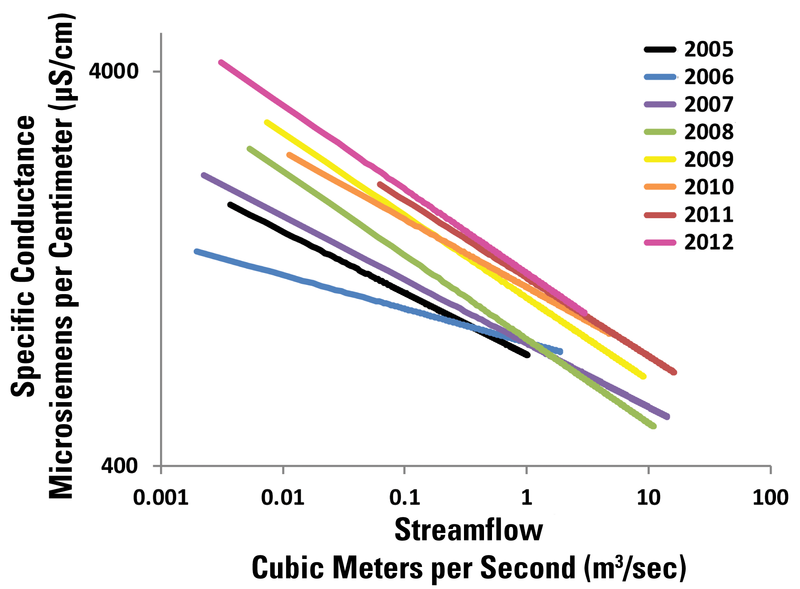 A comparison of streamflow and specific conductance (a measure of salinity) in Muddy Creek, Wyoming, for individual years from 2005 to 2012. Salt content decreases as streamflow increases, a common pattern in semiarid watersheds. The salt content in the later years has increased for any given streamflow rate (Bern and others, 2015, fig. 4). The scientists' goal was to identify candidate factors resulting in salinity increases in Muddy Creek, which has a relatively narrow range of land uses (grazing and oil and gas development) in the watershed. Numerous factors including soil disturbance, cattle grazing, irrigation return flow, groundwater discharge, reservoir discharge, stream morphology manipulation, evapotranspiration, regional climate fluctuation, and disposal of oil and gas coproduced waters can affect stream salinity. The scientists determined that soil disturbance due to construction is a reasonable explanation for the salinity increase. The results of the study suggest that soil disturbance, regardless of cause, should be considered a potential source of increased stream salinity in other settings where soils contain substantial qualities of native salts. Excessive salinity in streams and rivers can make the water unsuitable for domestic and agricultural use and for wildlife. Salinization is a threat around the world, but it can have many causes. Certain rock types, like marine shales, are more likely to develop salt-rich soils, and such soils exist in many semiarid and arid environments worldwide. The potential for construction disturbance to mobilize subsurface salts deserves consideration as development of all types is managed in dry environments. The USGS Mineral Resources Program, Bureau of Land Management, and Wyoming Landscapes Conservation Initiative provided the funding for this study. Bern, C.R., Clark, M.L., Schmidt, T.S., Holloway, J.M., and McDougal, R.R., 2015, Soil disturbance as a driver of increased stream salinity in a semiarid watershed undergoing energy development: Journal of Hydrology, v. 524, p. 123–136, doi:10.1016/j.jhydrol.2015.02.020.